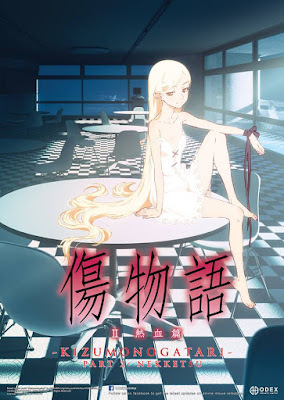 As you all might know, ODEX has brought several anime movies to Singapore for this week and I had the opportunity to watch two of them: "Kizumonogatari Reiketsu-hen" and "Suki ni Naru Shunkan wo (Honeyworks)". 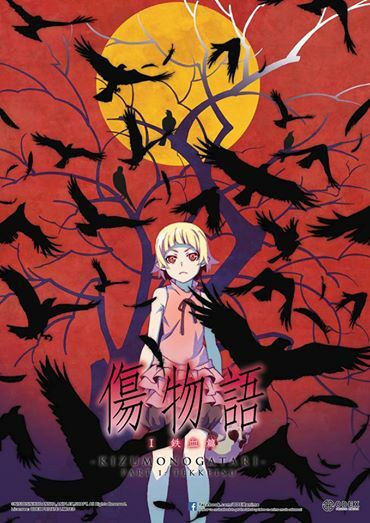 I will be reviewing them in two separate posts and will start with Kizumonogatari. 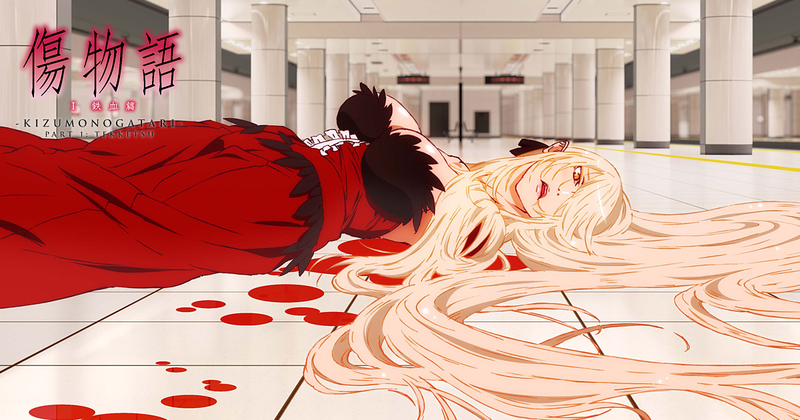 Kizumonogatari is split into three parts and this is the third and final part. As the screenings for the movie are all over, I'll give a brief summary of what it was about. If you intend to watch the movie in the future and do not want any spoilers, please skip the next paragraph! 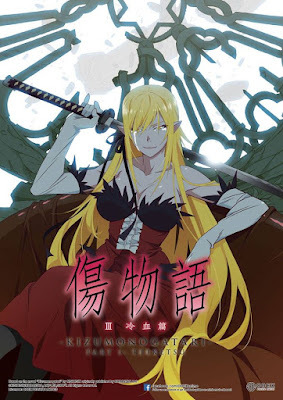 Part 3 is when Kiss-shot finally regains all her limbs back, courtesy of Oshino Meme, and decides to turn Araragi back into a human -- something which she couldn't bring herself to do for her very first servant/minion. Here we get a little insight on what Kiss-shot concerns are about immortality and her sacrifices. Likewise, Araragi's beliefs are also challenged when he comes across Kiss-shot eating a human and this sends him into despair as he realized what he has saved that day on the train platform is really a monster and he regrets his actions dearly. After Hanekawa gives him advice on what to do (peppered with slightly over-the-top lewd stuff and a significant proportion of oppai action), Araragi challenges Kiss-shot to a duel. 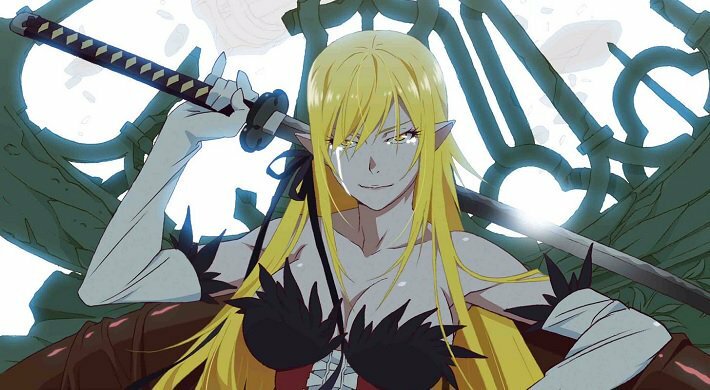 The fight finally ends with Araragi finally asking Meme for help and comes to a decision to weaken Kiss-shot enough so she'll be of no harm to humans but will not die either. Hence, bringing us back to her army-helmet Shinobu self. The movie itself was terrific. The pacing was rather good and it ties the entire movie back with Bakemonogatari, giving it a very well-rounded finish. 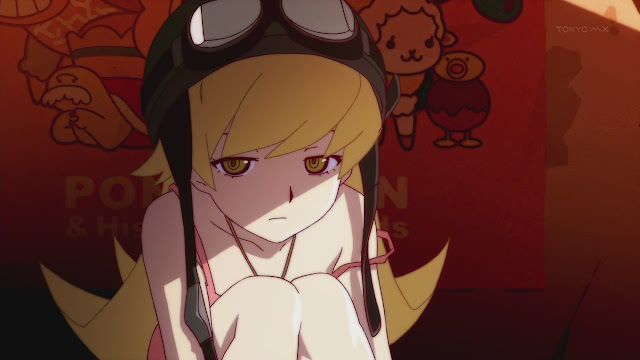 It also helped viewers and especially fans of the series to get a complete picture of what exactly is going on in that timeline and why Kiss-shot, being so active, is finally reduced to the silent and emo child in Bakemonogatari. Hanekawa was also given a great opportunity to shine, seeing as she was always rather overshadowed in the main series. Through all three parts of this movie, we get to see how the bond between Araragi and Hanekawa was forged and how they connected on a deeper level and had absolute trust in each other, to the point that they would even give up their life for the other. 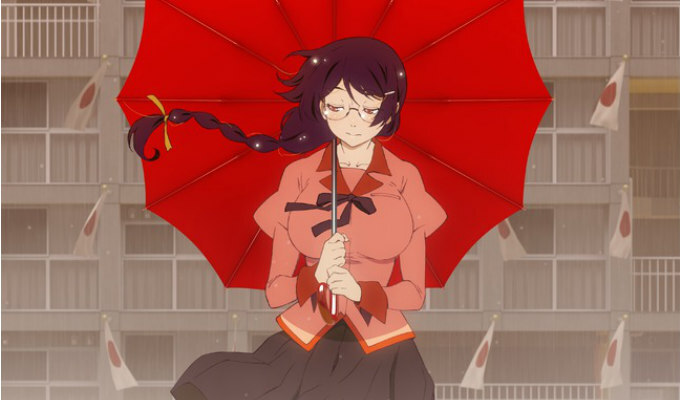 If there is one thing Kizumonogatari left me wondering, it would be why Araragi chose Senjougahara over Hanekawa. Music and OST in Reiketsu-hen was really appropriate. The humorous moments were well-placed and left the audience bursting with laughter. Something I like about Monogatari is how they are able to sneak in comedy into the most serious moments and still have it seem logical. An example I can give from Reiketsu-hen would be during Araragi and Kiss-shot's death match. As vampires with super regenerative abilities, both of them were in a heated battle filled with flying limbs and rolling heads. That is, the two were actually speaking to each other with heads rolling all over the area, from the background to the foreground. Yet the series (and SHAFT) had a way to make these gore moments seem not only appropriate but amusing. Lastly, the extras from the movie. Three A2 posters were given per person for each viewing in City Square Mall. These posters feature the three movie banners which show Kiss-shot at three different ages. I have 2 things to point out about this. Firstly, these extras were given in a Love Live paper bag which made it feel quite awkward, especially so for non-Love Livers. And secondly, these three A2 posters were also given as extras with the One Piece movie so those who went to watch One Piece are automatically entitled to get them -- making it a little pointless to watch Kizumonogatari on its own for the extras. 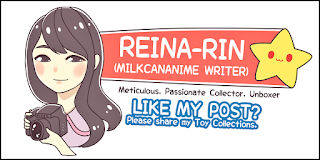 However, I would like to add that the movie was totally worth it for the price of $13 and if you are a fan of the series or just intend to give it a try, you should definitely give the movie a chance when it is finally available to the public! No Comment to " [ODEX] Kizumonogatari Part 3 Reiketsu-hen "